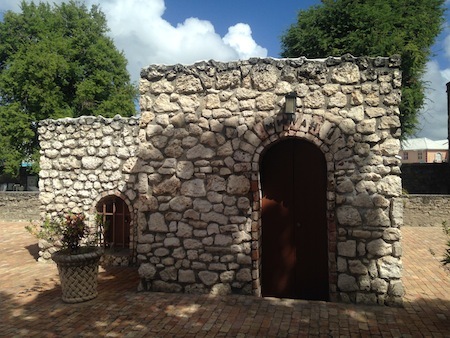 One of the oldest synagogues in the Western Hemisphere is in Barbados. I was living in Barbados, working on a Canadian agricultural development project, when I tripped over this unexpected fact. I knew that the real estate agent who helped me find housing – and who, not coincidentally, became my neighbour – was Jewish, but I had assumed he was an anomaly here, in the most eastern island of the Caribbean. This was not the place I had anticipated a Jewish story to unfold. The neighbour, Steven Altman, is reasonably well known in this small place where everyone seems to know most everyone. But many of the islanders I met inserted the comment, “he’s Jewish” into any mention of him, which reinforced my impression that being Jewish was unusual here. The Barbados I encountered in the seven months I lived there is a place that runs according to racial categories and everyone seems to be categorized according to skin colour and place of origin. Even though I’m half-Jewish, I was the white Canadian woman at work. Curiosity prompted me to board a crazy ZR van headed into Bridgetown one day to find out more about Nidhe Israel Synagogue. ZR vans are semi-unregulated transport vehicles built to seat about 10 passengers, though I’ve been in them packed with more than 20 fellow travelers. People squish in, pressing up against each other with infinite stony-faced endurance. The soca music is generally blaring and often the driver has the flag of some neighbouring island pinned to the front, indicating where he lived before ending up in Barbados driving the public bus route in a private vehicle. The cost is always exactly two Barbadian dollars to ride and the experience is totally worth it. 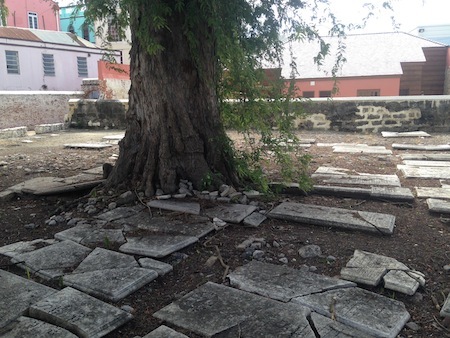 The Synagogue Historic District is a UNESCO World Heritage Site in the Barbados capital city of Bridgetown. Originally built around 1654, it was destroyed by an 1831 hurricane, rebuilt in 1833 and restored from 1987 through 2017. Constructed by Sephardi Jews fleeing Recife, Brazil, after that colony passed from Dutch to Portuguese hands, these arrivals sought the relative safety of British-controled territory. The Jewish community was able to practise their faith openly here even before they regained that right in England. The refugees settled into housing on Jew Street (now Swan Street) and brought with them knowledge and experience of the sugar cane industry. For this, I raise a glass of fine Barbadian rum, as this accident of history resulted in a terrific local finished product. By the mid-1700s, the Jewish community was 800 strong, which was the peak of Jewish settlement. The hurricane in 1831 was a disaster that destroyed more than just the synagogue, resulting in an exodus to the United Kingdom and the United States. By the 1920s, only one Jewish resident, Edmund Baeza, remained, holding the keys to the building. When he, too, left, the synagogue was sold and deconsecrated. By the 1980s, the building was dilapidated, in use as a warehouse and destined for demolition, when a renewed Jewish community stepped in to begin the process of restoration. The synagogue officially reopened in April 2017, and it is a gorgeous, tranquil and instructive space. When my neighbour Steven boasted that it was his family that was responsible for the resurgent Jewish community in Barbados, I filed away his comment with a few of his other questionable statements, such as when he had appealed for my company on the basis of needing someone to wash his laundry. Steven wasn’t even aware that I might take offence. Standards of male expression and behaviour are one of the more dubious cultural differences for a Canadian woman living temporarily in Barbados. Despite my skepticism, however, the Altmans were indeed a primary element of the reconstruction effort and are longstanding pillars of the community, according to the plaques at the synagogue. Steven, when asked, wistfully described the tight-knit community of his childhood, drawn together to play games, fundraise for charity and visit each other’s homes, in addition to worshipping together. I grew to enjoy hearing Steven’s voice trailing out the windows of his home and through the tropical evening heat when he practised the prayers for services; it became a pleasant part of my experience of Barbados. The second wave of Jewish Barbadians was Ashkenazi, mainly fleeing Europe, starting to arrive shortly after Baeza’s departure. My tour guide at the synagogue museum, curator Celso H. Brewster, described desperately seasick travelers bound for South America with skeins of cloth and other mercantile goods to start anew, stumbling out onto the solid ground of Barbados and refusing to go any farther. They set up shop in Bridgetown instead of continuing their journey. As for Celso himself, he informed me that he was Baha’i but that he did have some Jewish roots as well. Those roots travel through his family line via a version of what was once a Jewish name, bestowed on a born-out-of-wedlock ancestor via a certain plantation holder with, shall we say, quite liberal application of his affections. I’ve heard various versions of this story from other Barbadians. Jews were not only merchants, but there were some Jewish pirates and, sadly, Jewish slave owners. 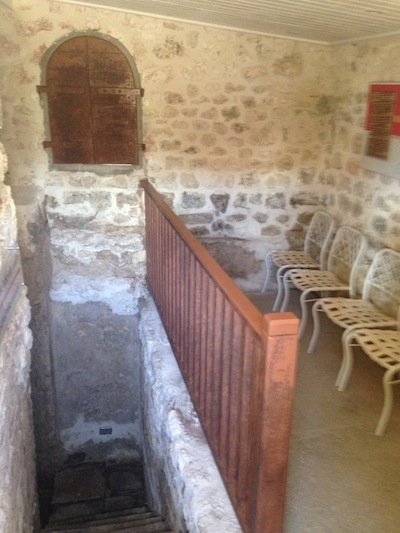 Nidhe Israel Synagogue and its grounds – which include the original mikvah, which was uncovered in 2008 to reveal a still-flowing spring; an extensive cemetery, as well as a museum – is a beautiful oasis for thoughtful reflection and learning. The Synagogue Historic District is located on Synagogue Lane, Bridgetown, Saint Michael’s, Barbados. The museum is open weekdays, 9 a.m. to 4 p.m. It is free to enter the courtyard to look around; the entrance fee to the museum is $25 BDS (about $16 Cdn). To find out more, visit synagoguehistoricdistrict.com. Better yet, visit the synagogue. Tasha Nathanson recently returned from a stint in the eastern Caribbean as gender equality and youth empowerment advisor on a World University Service of Canada project. It was the model of dignity and decorum in a ludicrous situation. When Israeli judoka Tal Flicker won a gold medal last week at the Judo Grand Slam in Abu Dhabi, in the United Arab Emirates, his excitement was diminished by the Emirati host federation. Because of Flicker’s nationality, the UAE refused to play the winner’s national anthem or raise his nation’s flag. Instead, while the gold medal winner stood under a flag of the International Judo Federation and the federation’s theme song played, Flicker had to quietly sing his own private rendition of Hatikvah, the Israeli anthem. Similarly, when Israel’s Tohar Butbul beat an Emirati judoka, the defeated competitor turned his back on Butbul’s extended hand, carrying through the tournament’s motif of betraying the values of judo in particular, and sports more generally. Israel went on to win five medals in all at the tournament, with the rudeness by Emirati organizers repeated again and again. (The Israeli team was also forced to remove their nation’s flag from their uniforms.) Yet Flicker’s grace, and that of the other winners, was a model that Israelis and Jews worldwide – indeed, anyone with a smidgen of sportsmanship – should admire. In what was a small consolation, two senior Emirati sports officials later apologized to the head of the Israeli judo delegation for the loser’s refusal to shake Butbul’s hand. But there has been no apology for the larger silliness around the Israelis’ participation in the competition. In an ideal world, international sports federations and other bodies would reward behaviour like the UAE’s by preventing them from hosting major events for a specific period and demanding in advance that the most basic tenets of sportsmanship be respected by any country that hopes to host. In the bigger picture, the incident demonstrates the absurd treatment Israel receives in the international community more broadly. The latest example, which also happens to involve the UAE, occurred on Monday in Paris at the 39th general conference of UNESCO, the United Nations Educational, Scientific and Cultural Organization. The UAE struck a commemorative medal to mark the renovation of UNESCO’s conference room. The medals feature a portrait of Hamdan bin Rashid Al Maktoum, the UAE’s finance minister (a keepsake for sure!) and one was left on the desk of every UNESCO member-state except … the Jewish one. The United States and Israel will withdraw from UNESCO. The United Nations Educational, Scientific and Cultural Organization is one of the most impressive and vital global agencies addressing international cooperation on this range of human endeavours. Unfortunately, like the United Nations itself, which exemplifies unfulfilled promise, it has been coopted into the service of Israel-hating forces. The irony here is that, by succumbing to the influence of Israel-bashers, UNESCO is in cahoots with countries that betray the most basic concepts of free expression and democracy. The U.S. State Department announced last week that it would quit UNESCO and, while insisting that Israel was unaware of the impending announcement and that the decision was uncoordinated between the two countries, Israel’s Prime Minister Binyamin Netanyahu announced that Israel would follow its ally and also leave the agency. Coincidentally or deliberately, UNESCO elected its first Jewish director general just days after the United States’ announcement. France’s former minister of culture, Audrey Azoulay, was elected to the leadership role, outpolling the Qatari perceived frontrunner, in a vote by UNESCO’s executive last Friday. The United States was in arrears to UNESCO to the tune of $550 million and even a U.S. State Department spokesperson didn’t deny that money figured into the calculation. The United States stopped paying its dues to UNESCO in 2011, when the agency admitted “Palestine” as a full member state. In July, UNESCO declared Hebron an endangered World Heritage site, diminishing the Jewish people’s ancient and contemporary connections to the city, home to the tombs of the Patriarchs and Matriarchs. UNESCO has also adopted resolutions that call Jerusalem “occupied” territory, acknowledge Muslim but not Jewish historical connections to the Temple Mount area and repeatedly reinforced a common Palestinian position that Jews have little or no historical connection to the land of Israel. The question is, do you stay and fight or give up and decamp in protest? A similar paradox occurred at the United Nations-sponsored World Conference Against Racism, in Durban, South Africa, in 2001. When it became clear that the event had been commandeered not only by anti-Zionist elements, but by some of the most antisemitic forces in the world, the United States and Israel walked out. Canada stayed. The Liberal government of the time justified the decision by saying they could remain as a voice of critical reason. There are legitimate cases to be made for both positions. In choosing to leave the organization as a member but remain as an observer state, the United States found the right balance. They can continue to make their opposition to UNESCO excesses heard, without countenancing them morally or financially. At least, that is how it would work in a world in which Donald Trump was not president of the United States. In this, as in so much, Trump changes everything. While the administration’s decision on UNESCO may be a decent one, in context with other decisions of the Trump administration, it becomes part of a retraction of American influence in and engagement with the world. Trump is motivated by spite, not by principle. While another president could have made the same move and explained it as a principled defence of the country’s most important ally in the Middle East, this president’s lack of principle and surfeit of malevolence relocates even defensible positions into a constellation of petty pique. Despite its manipulation by anti-Zionist ideologues, UNESCO remains an invaluable institution, doing much good work in the world. Even while maintaining observer status, the U.S. decision is likely to be read by critics not as a repudiation of what UNESCO does wrong, but as part of an ongoing American trend against all that is good in culture, science and education. Context matters. Like Richard Nixon in China – OK, perhaps not really like that, but at least in the respect that a president with some credibility in areas relevant to UNESCO could get away with repudiating it – a president Hillary Clinton (or Bill Clinton, or Barack Obama) could have withdrawn from UNESCO and not made their country look like a collection of petty Philistines. When a president who has little demonstrated respect for culture, education or science withdraws from a global organization dedicated to these pursuits, it probably legitimizes UNESCO more than it delegitimizes it. Worse for Jews, this tight friendship between Trump and Netanyahu reinforces perceptions of the Jewish people – or, at the very least, the Jewish state – as ideologically entwined with a figure who seems destined to go down as the most ineffectual and destructive president in American history. Not an enviable place to find oneself. There are those who envision a future without Israel in it. No one knows what the future holds, yet there are some who, in their enthusiasm for a future without a Jewish state, are reinventing the past. Last week, UNESCO, the United Nations Educational, Scientific and Cultural Organization, passed a resolution that effectively negates millennia of Jewish history at the Temple Mount in Jerusalem. The holiest site in Judaism and the physical centre of the Jewish world, is the place where the first and second temples stood. The remnants of the Second Temple, the Western Wall, is the place on earth toward which Jews have prayed for 2,000 years when they have not been able to pray at the Wall itself. The land is contested because, in the eighth century, Al-Aqsa Mosque was constructed on the site of the temples’ ruins. To be generous, the Jews may have been there first, but it is nevertheless a holy site for Muslims as well. Tell that to UNESCO. According to the wildly ahistorical resolution last week, Jewish claims of ancient connection to the place are bogus. In addition to pages of condemnations of Israel, the resolution repeats familiar accusations that deny any Jewish connection to Judaism’s holiest site. The resolution was submitted by Algeria, Egypt, Lebanon, Morocco, Oman, Qatar and Sudan, countries that each have their own unique challenges that nevertheless do not detract from their obsession with imagined Jewish slights against Islam. This sort of nonsense spewed up from agencies of the UN, to say nothing of the General Assembly, further undermines the legitimacy of what could be the world’s most valuable international forum and makes a mockery of the vision of the UN’s founders. None of this matters, of course, to the inmates who are running the asylum. Canadian participants in a meeting earlier this month with French President François Hollande came away impressed with the French leader’s sincerity and determination to address the terrorism and antisemitism that has France’s Jews on edge. Avi Benlolo, president and chief executive officer of the Friends of the Simon Wiesenthal Centre, and Member of Parliament and former justice minister Irwin Cotler said Hollande was empathetic to the concerns of the country’s Jews and was forthright in discussing the threat posed by French-born jihadists returning from Syria. “Hollande spoke about the barbaric attack on the Jewish museum in Belgium” and about the protection of Jewish schools, synagogues and other community buildings, Cotler said in a telephone interview from Jerusalem. Simon Wiesenthal Centre, which met with Hollande prior to officially inaugurating an historic exhibition at UNESCO’s Paris offices. The exhibit, mounted by historian Robert Wistrich, is titled, People, Book, Land: The 3,500-Year Relationship of the Jewish People to the Holy Land. The exhibit was sponsored by the Simon Wiesenthal Centre along with the governments of Canada, Israel, the United States and Montenegro, and it launched this month after pressure from Arab countries forced its cancellation in January. Benlolo said the reception by French officials and Hollande at the Élysée Palace was warm and welcoming. 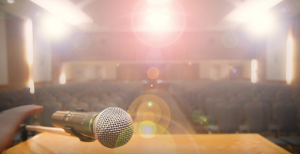 The delegates were anxious to express their concerns about the attack on the Jewish Museum in Brussels by a French gunman, who killed four people. “Hollande believes there are more than 1,000 French nationals who went to fight in Syria and joined radical groups,” Benlolo said. Three hundred remain. Many came back and he’s concerned about their radicalization and if they will take action against the Jewish community. Mehdi Nemmouche, the man accused in the Brussels attack, is believed to have spent 2013 fighting with Islamic radicals in Syria. Hollande assured the delegates that he is working closely with intelligence and security services to track returning jihadists and to ensure the safety of the country’s Jews. “I believe Hollande was very sincere,” Benlolo said. “The Jewish community received substantial grants to secure their schools and synagogues,” he added. He applauded Hollande and his predecessor, president Nicolas Sarkozy, for denouncing an earlier terrorist attack in Toulouse that claimed the life of a rabbi and four children, but he lamented the failure of Muslim religious leaders to condemn the attacks. “It is a remarkable dramatization of history and heritage, of people, book, land, memory and state,” said Cotler. In 24 panels, the exhibit traces Jewish history back to the patriarch Abraham, through Moses, King David and all the way through to the struggle for Soviet Jewry, the birth of Zionism and the reconstitution of the state of Israel. The nine-day exhibit had been scheduled to open last January. Pressure from 22 Arab countries, who argued it would prejudice the peace process, prompted UNESCO to cancel it. Following public criticism from Canadian Foreign Minister John Baird and U.S. envoy Samantha Power, the exhibit was rescheduled to open early this month, but with the name Israel removed from the title and replaced with “Holy Land.” UNESCO also required the removal of an image of the Dead Sea Scrolls, which had been part of the initial exhibit prepared by Wistrich, a professor of European and Jewish history at the Hebrew University in Jerusalem. – For more national Jewish news, visit cjnews.com.